With our diabetes-management-software SiDiary you can easily import data from your Ypsomed mylife YpsoPump insulin pump and use lots of advantages of statistical analysis, trend analysis and graphics to improve your therapy together with your doctor. The picture shows the data transfer from the Ypsomed mylife YpsoPump. 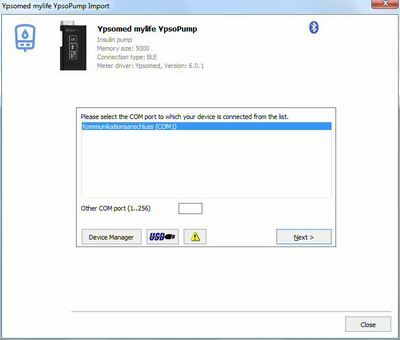 SiDiary's Ypsomed mylife YpsoPump driver imports almost all historical data via Bluetooth. Please read in your pumps manual on how to pair this pump via Bluetooth with your PC. Click here to go directly to the producers page of this pump.